Have you ever visited a place you’ve only seen in books, but gazed upon so often that you felt you knew it? It’s like stepping through the looking glass, and removing the glasses you are wearing that have blinders on the sides. A month ago we followed the narrow lanes of County Cork, navigated the traffic rings around Cork city, and traveled again on narrow lanes toward the sea, watching islands appear above the many-colored green hills. 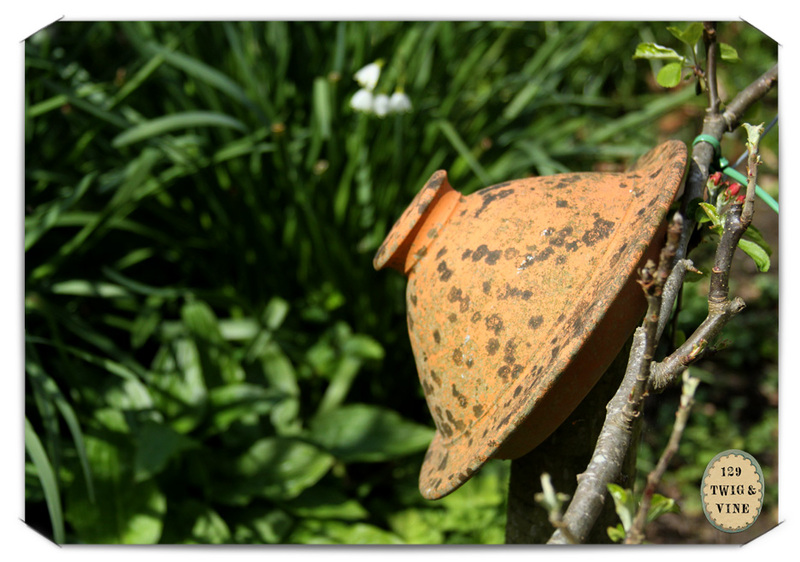 Past grazing cows, ivy covered trees, yellow houses and magpies sitting on fences, we came at last to two special places—the pottery studio of Stephen Pearce (which I’ll save for another post) and the gardens at Ballymaloe Cooking School. Several books on my shelves in Vermont feature photographs of Darina Allen’s gardens at the Cooking School (not to be mistaken with Ballymaloe House, which is about 4 miles away). One is Darina’s own book about cooking in the seasons and the other is The New Kitchen Garden by Anna Pavord. 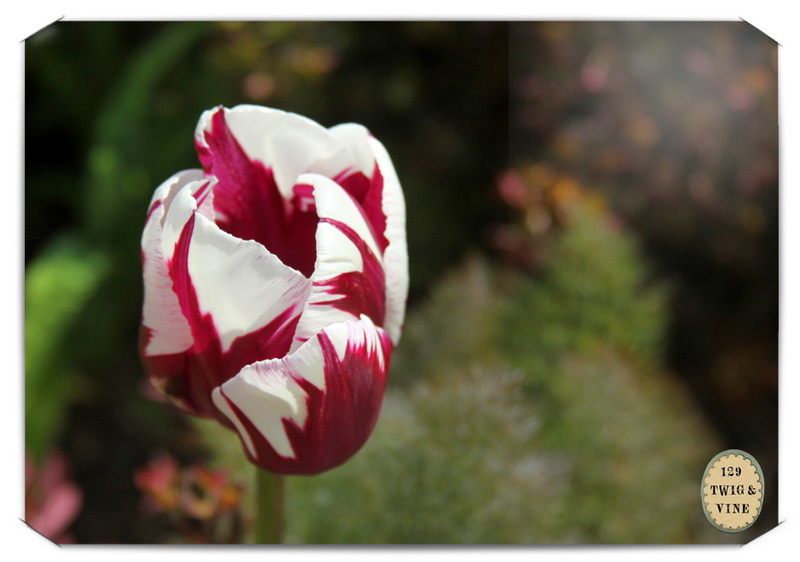 I can’t count how many times I’ve gazed at these garden photos. Mostly on winter days in January and February when I pull out graph paper and pencils to start thinking of garden plots and designs for the coming spring. So to arrive at last, and see the ocean, so near at hand, and follow the long stone wall leading into the Cooking School, sent my heart racing. The full 360 view of the place—now that I could shed my blinders and step off the book page—revealed beauty and surprises at every turn. The gardens were more vast than I’d suspected, the entire farm going on for acres with Kerry cows, Tamworth pigs (that ran toward us across their field in jubilation, and when we didn’t feed them, ran just as jubilantly back across their field), free-ranging chickens, and lengths of greenhouses that gleamed against the fields when the sun came in and out of clouds. As usual, the forecast was grim for this particular day. And as usual, the sun came out and thumbed its nose at the forecast. We had days on end with sun, though some days were chill with wind. This particular day was more mild and perfect for garden strolling. And so we spent several hours walking the gardens of the Cooking School, finding last the kitchen garden—the one I have most stared upon in pictures—with its herringbone brick paths edged with nasturtiums in summer. It was not summer, so no sign of nasturtiums. The beds were turned and ready for planting. The hazel scarecrow figures were in place, standing much taller than me and casting their whimsical glance across the beds, guarding the fava bean sprouts transplanted only hours before. The edges brimmed with yellow primroses, and the whole space suggested fecundity and promise. 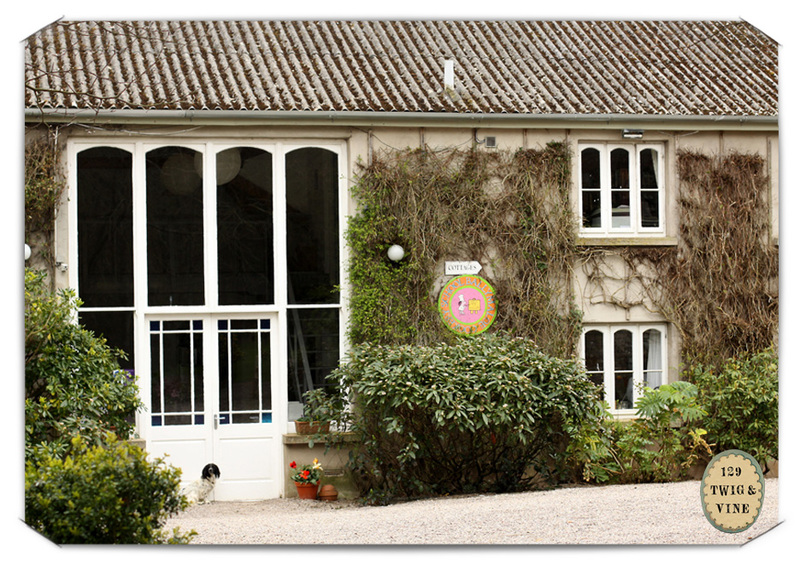 The food produced here at the Cooking School is used in its own kitchens and over at Ballymaloe House in its restaurant and cafe, and down the road at Stephen Pearce’s cafe too. 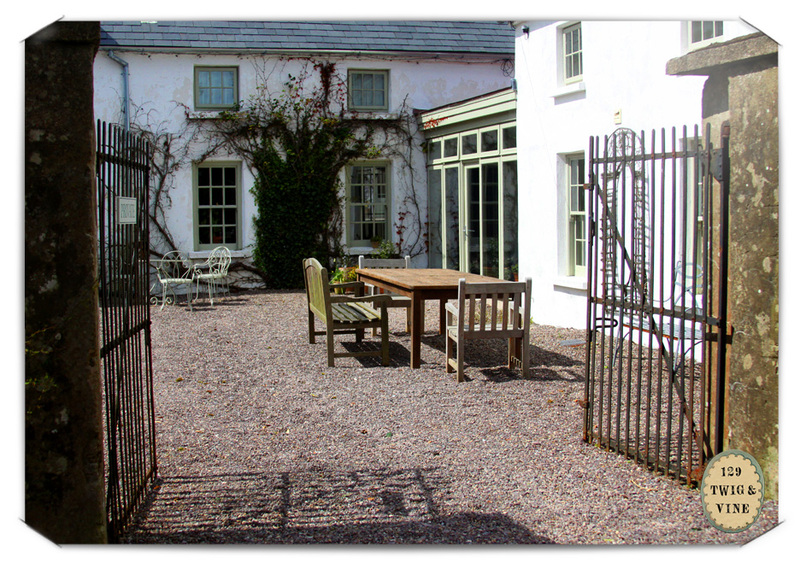 Between gardens, the paths followed along the house and lodgings where visiting chefs stay. Other than one couple, the only company we found were a few garden workers and the occasional man or woman in chef’s whites crossing a garden to snip an herb or following a path back to who knew where. The gardens charge a small fee to visit. Well worth it. Lunch can be had at the Cooking School cafe seasonally (not open yet in April) or at Stephen Pearce (5 minutes away) or Ballymaloe House (less than 10 minutes away). We went to the Ballymaloe House Cafe and had a delicious lunch while each recalling favorite moments from our garden visit: the hornbeam maze? the shell house? the strutting rooster? the fritillaria among the orchard trees? 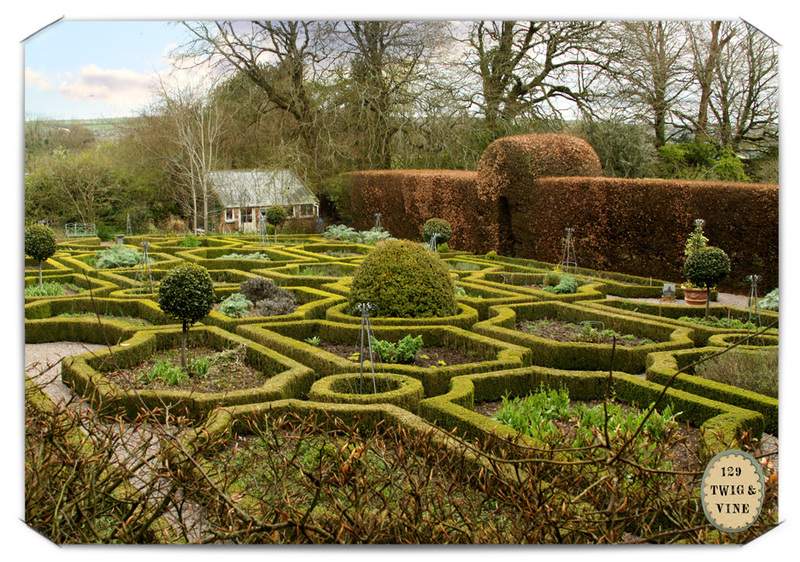 the formal herb garden edged in Medieval style with knots of low boxwood hedge? I recently bought some boxwood so I could start my own boxwood hedge! Oh, wonderful, wonderful! I’ve been looking at the same books..how lovely to get there in person! Wow! Sounds like an amazing outing. What a beautiful post. The photos are delightful and the text so well-written. Seems a wonderfully beguiling place. Perhaps one day I will get the 360 degree experience but for now this is pretty enjoyable! How amazing!!! Just a beautiful post of a beautiful place on this earth. I’ve always dreamed of going to County Cork, as that’s where my extended family lives. I can’t even comprehend the beauty and magical touches of Ireland I see through your pictures. Thanks for always brightening my day with these posts! Absolutely something out of a dream. Truly beautiful. Lucky you! And thanks for reminding me to explore the many interesting gardens and places that aren’t so far from my own doorstep.